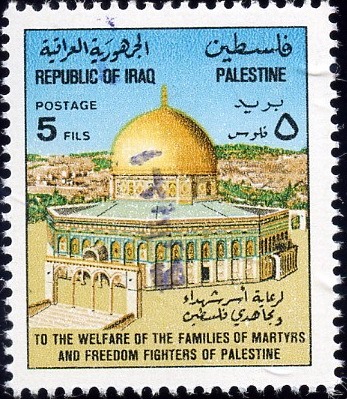 Following is an attempt to illustrate the differences between the many 'Dome overpints' issued in Iraq during the 1990's. 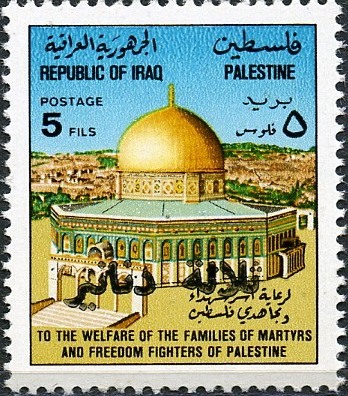 Most were issued during 1994. 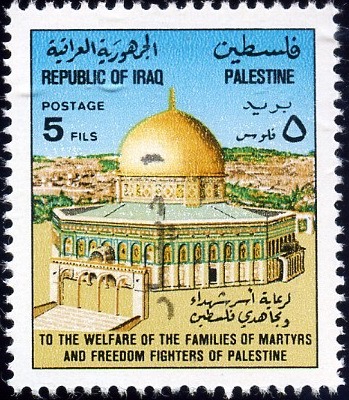 The original stamps were issued on 15th May 1977, and showed the Dome of the Rock in Jerusalem. 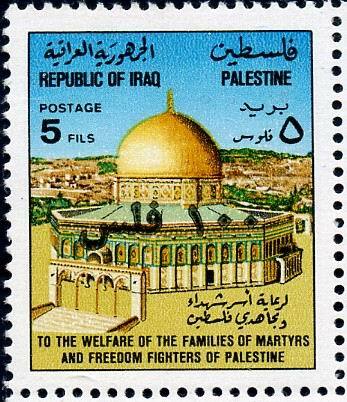 They were inscribed "To the Welfare of the Families of Martyrs and Freedom Fighters of Palestine". 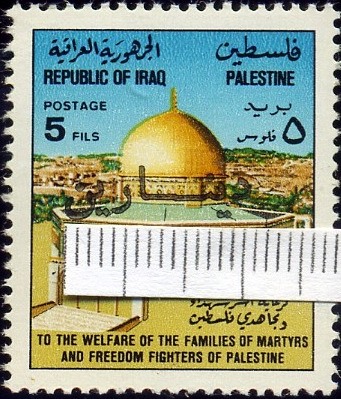 Michel catalogue listing is Iraq 912 and SG is Iraq 1291. 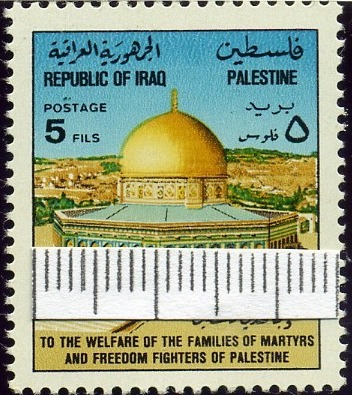 The frame width of each stamp is 23.5mm and the frame height is 28.5mm. 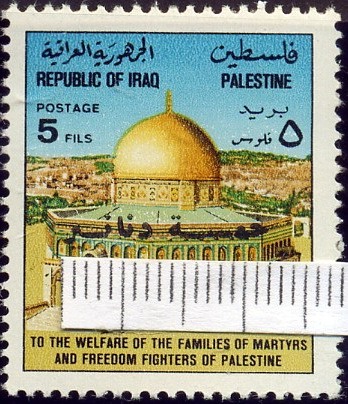 The overprints were added in Baghdad, except for the two issued in Erbil. All the illustrations of both thumbnails and enlargements are the same size. Scans are at 300dpi. 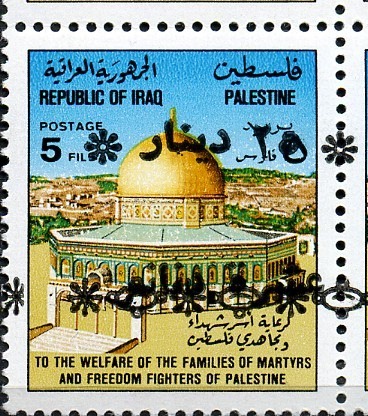 The exception is the scan of of the pair of One Dinar overprints which is not to scale with the other scans. If I have made any mistakes with the illustrations and catalogue references then I apologise, but please let me know what you find to be incorrect. 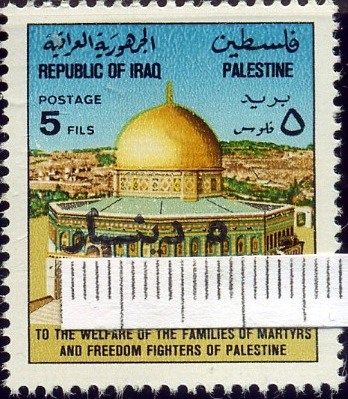 Two overprints issued only in Erbil in the Iraqi Kurdistan region are also shown below but these are not shown in any catalogues. 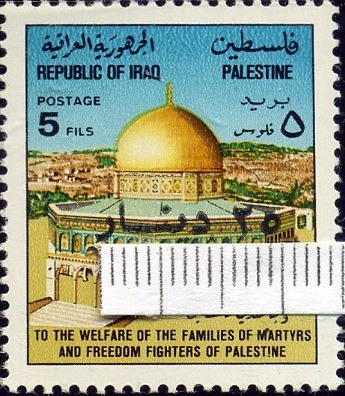 Two 'varieties' of One Dinar' overprint are to be found in a single sheet and an illustration from a corner block is shown. 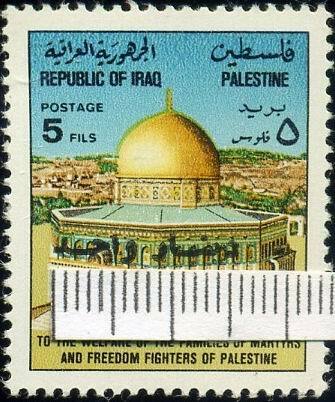 I will accept no liability or responsibility whatsoever for persons buying any Dome overprints from a source other than Magan Stamps and who use this listing as a guide to their choice of purchase which they later find to be incorrect or inconsistent with any catalogue listings. 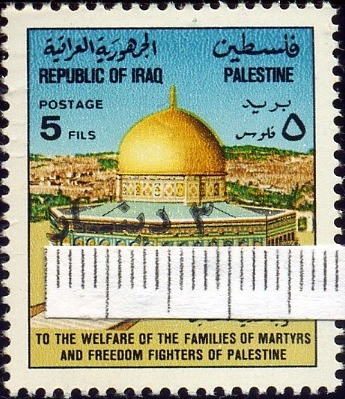 Place mouse pointer on stamps to see enlargements. 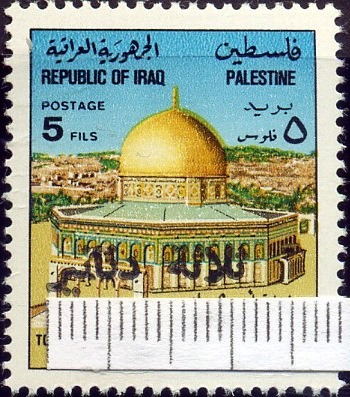 500 Fils overprint 14.5mm long issued 1994. Michel give 2 varieties of the 14.5 mm overprint 1517-I with with higher characters and 1517-II with lower characters but unfortunately do not illustrate these. 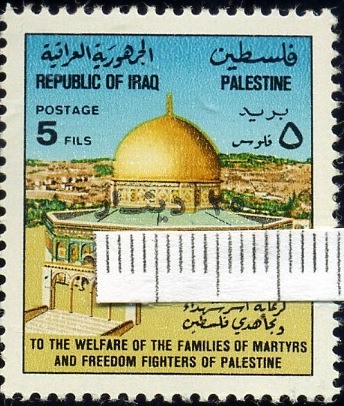 They also list a 17mm long overprint [1517-III] which I have yet to see & so do not have available for illustration. and SG show different cat. numbers for each difference [SG 1941-1944]. 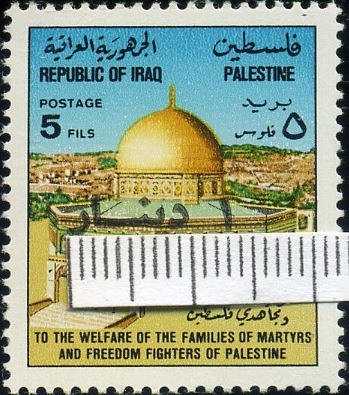 There are many differences in both the length and the height of the overprints and the Arabic words 'One' and Dinar'and also have differences in the actual letter characters. A bit of a headache for collectors! 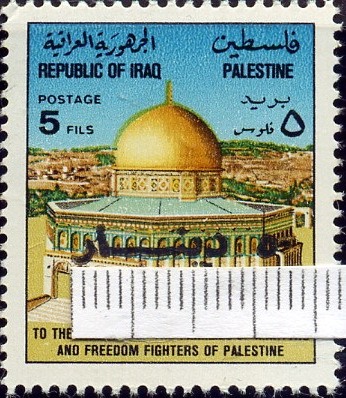 Because of the inconsistent density of ink, and other variations no doubt caused by the difficulties being experienced by the printers at that time - remember that severe sanctions were being applied to Iraq during the 1990's - variations in size of 0.5mm, or even 1mm, seem inevitable and so in my opinion also irrelevant unless the characters themselves or the spacing between words are obviously different. Only one of the 1 Dinar varieties has the '1' in Arabic numerals. 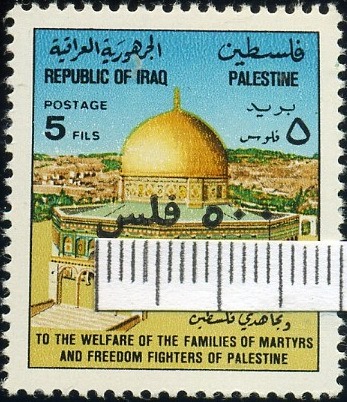 All other One Dinar overprints are with 'One' in Arabic script. 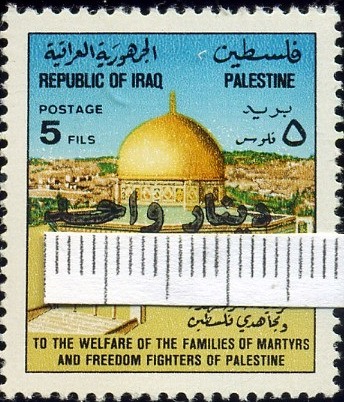 Both SG and Michel fail to indicate this point, also that the varying lengths of overprints are all to be found when the 'One' is in Arabic script. 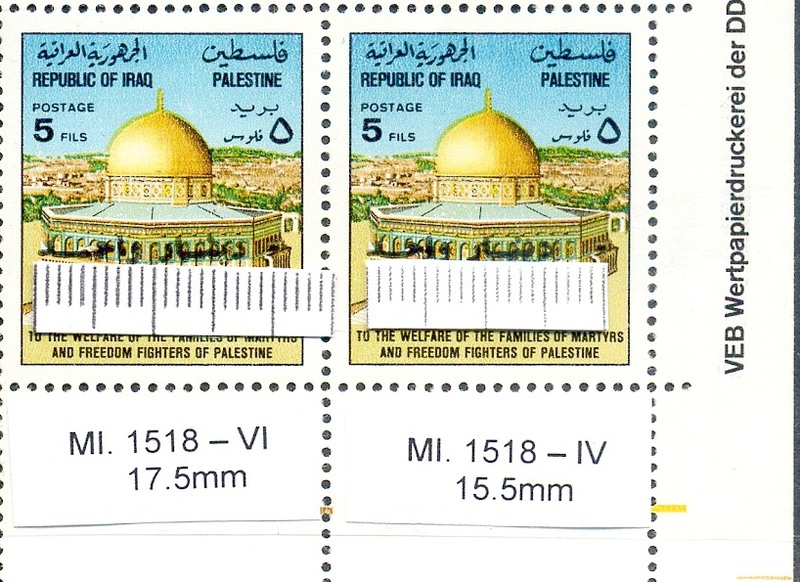 Michel 1518-IV and Michel 1518-VI overprints are to be found in the same sheet of 50 stamps [10 columns X 5 rows]. 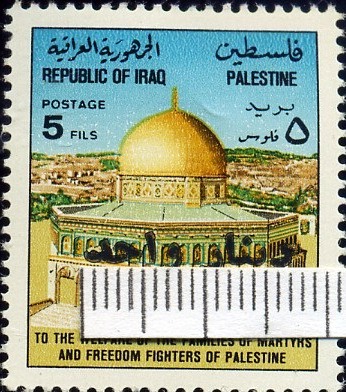 The longer 17.5 mm overprints are in columns 2 and 9. 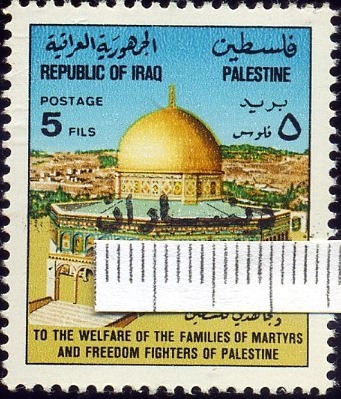 I have only seen these different overprints in corner blocks from both sides of the sheet. I have them from NW, NE, and SE corners. Blocks from the top margin [not corner blocks] and blocks from within the sheet all have the 15.5mm [Mi. 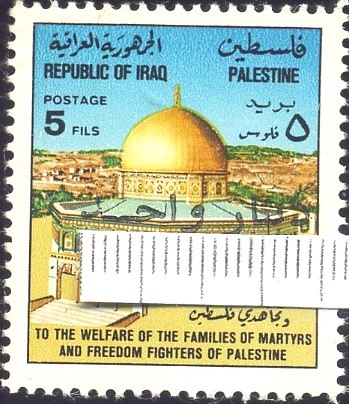 1518-IV] overprint, so I assume [aways a dangerous thing to do!] that the longer 17.5 mm [Mi. 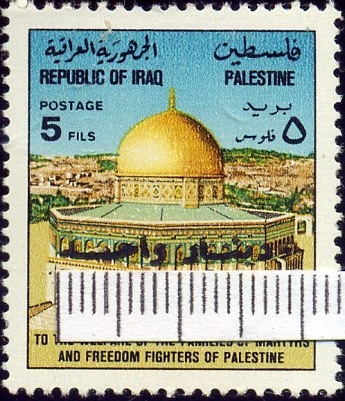 1518-VI] occurs in only columns 2 and 9, so only on 10 stamps in each sheet of 50. 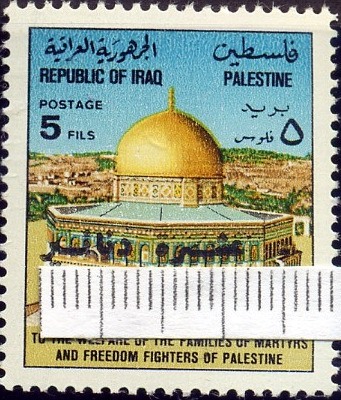 25 D overprint on previous overprint. 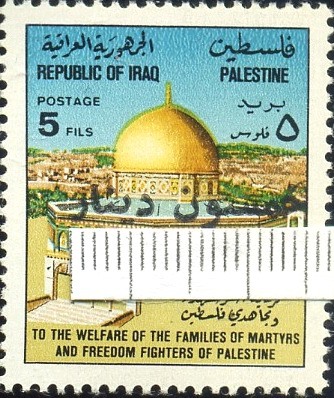 These overprints are not listed in any catalogues but some FDC's were issued and some stamps can be found on mail - but are extremely rare.